The Video: Spider-Man: Into the Spider-Verse comes with a 2160p UHD image with HDR and is presented in 2.39:1 aspect ratio. The 4K UHD streaming option on those streaming devices is capable of Dolby Vision, but unfortunately there was no such Dolby Vision on the physical Disc. Still, this video presentation is quite amazing with its unique animation style that can throw you off quite a bit. Fir instance, there are several scenes where it looks like you are watching a 3D image without 3D glasses, where background items are blurry or seem out of place. Don’t worry, this is all part of the strange, but fun animation style the filmmakers decided to use here. It’s unlike anything you’ve ever seen and goes hand in hand with the story being told with multiple universes and such. The detail of facial features and costumes aren’t as detailed as say a recent Pixar film, but the detail is there where you’ll see the different stitching in the Spider-Man costumes and different facial features on each hero. Even the background items of city buildings and even trees in a rural area look insanely good. The flow of the animation is a little choppy, more so than what you’re probably used to, but again that’s the style here and not a video problem and it might take some getting used to. Colors are bright, bold, and beautiful on every level. That HDR surely ramps each primary color up from the different variations on the Spider suits to the darkness levels at night. This is on colorful movie with a wide spectrum of objects and colors, which are all accentuated by this 4K UHD presentation. Black levels are deep and inky and the animation lines are top notch. There was no real issue with any banding or aliasing here, even in the heavier action sequences, leaving this video presentation with top marks. 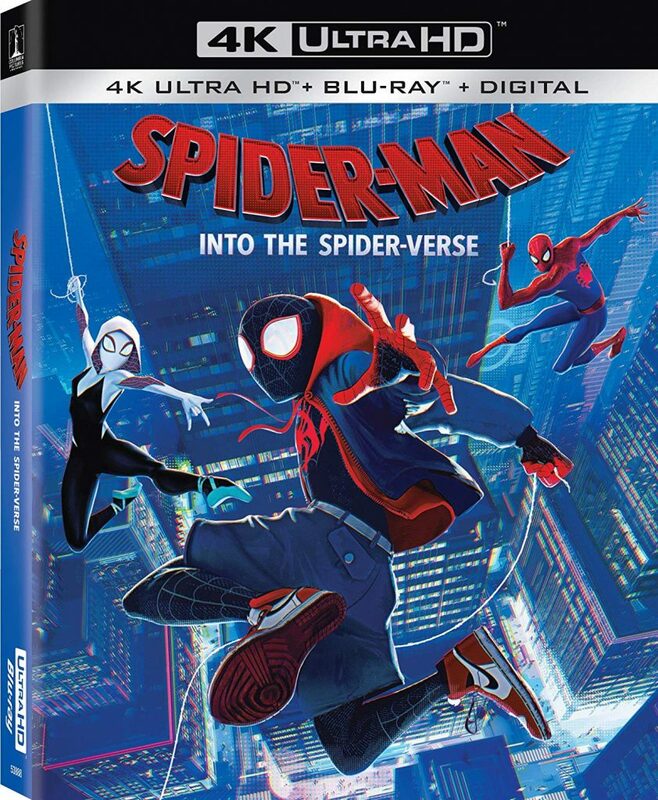 The Audio: Spider-Man: Into the Spider-Verse comes with an impressive Dolby Atmos audio mix, which is just sublime. The atmospherics on this audio track are big, robust, and very loud. This is one track you’ll want to turn up. Surround speakers and overhead speakers come packing a punch and quite often with a ton of web slinging action in all corners. You’ll hear debris and objects being crushed, broken and thrown around the room. You’ll hear every object fly from one speaker to the next in a fluid motion, which is spectacular just like the many Spider heroes are in this film. The big explosions and different universes and the travel to get there all have big sonic forces that totally engulf the soundscape, which will immerse you in the center of the fun. The overhead speakers bring down rain, other super heroes or villains descending from the sky and other height elements in. good quality sound. I was impressed. In quieter moments, the reverb and echoes are nuanced and well balanced such as dialogue in a black alley or underground lair. The music and score is energetic and fun that brings the low end of bass with an excellent, loud rumble. Dialogue is clear and easy to follow along with and free of any pops, cracks, hiss, or shrills. This is a top notch audio mix. Audio Commentary – Co-writer/producer Phil Lord, producer Chris Miller, co-directors Bob Persichetti and Peter Ramsey, and co-director/co-writer Rodney Rothman all give a fun and energetic commentary track with this film, which I recommend you all listen to at least once. There are a ton of fun and interesting information throughout the commentary track on why the filmmakers chose to animate it the way they did, along with a ton of hidden Easter eggs they point out along the way. This is one of those commentary tracks that you’ll want to listen to multiple times. Spider-Ham Caught in a Ham Short (UHD, 4 Mins.) – A quick little short with Peter Porker, the Spider-Pig universe where he is fighting crime and living his life. We also see what he was doing before he was pulled into the universe in the film. Alternate Universe Mode (HD, 84 Mins.) – This is basically the same movie, but with some added/deleted scenes, characters, and other sequences added into the film. Some are unfinished, but is well worth the time. This is pretty cools stuff. The Ultimate Comic Cast (HD, 15 Mins.) – This has the cast and crew talking about their characters and how they got the voice role, which turns out seems like each cast member was able to free flow and improv quite a bit. We Are Spider-Man (HD, 8 Mins.) – Another cast and crew interview segment where everyone talks about the core story, themes, and characters of the film and how much they like Spider-Man. Spider-Verse: A New Dimension (HD, 5 Mins.) – This is a cool, but short look at the unique animation style process and how they brought everything to life with interviews from the cast, crew, with a focus on the animation team. Designing Cinematic Comic Book Characters: Heroes and Hams (HD, 8 Mins.) – This focuses on the heroes of the different Spider Universes that discuss, character traits, costumes, voice acting, and animation style. Designing Cinematic Comic Book Characters: Scoundrels and Scorpions (HD, 5 Mins.) – Basically the same as above, but talking about the villains of the film. Tribute to Stan Lee and Steve Ditko (HD, 9 Mins.) – Stan Lee himself talks about his life, career and Spider-Man along with the cast and crew talking about how Stan and Steve influenced their creative lives. Spider-Verse Super Fan Easter egg Challenge (HD, 5 Mins.) – There are quiet a few Easter eggs in the film and this lists them out for the most part. Music Videos (HD, 3 Mins.) – Horrible music. Feel free to skip. 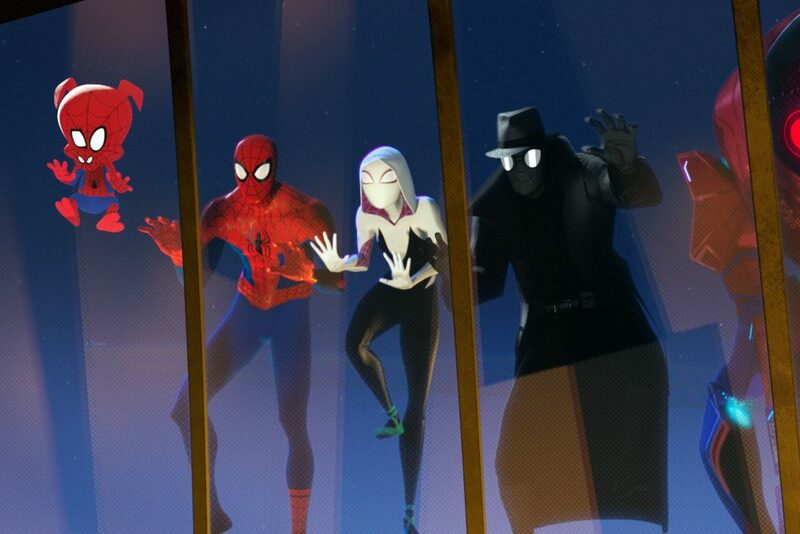 Spider-Man: Into the Spider-Verse is a fantastic take on the Spider-Man franchise. They pay homage to each film and tv series out there while being , fun, energetic, thrilling, funny, and having a good message. It’s great for the whole family and there are enough Easter eggs for the super fans out there as well. This 4K UHD/Blu-ray set is quite spectacular as it comes with a Dolby Atmos track, HDR color, and a ton of worth-while bonus features. This is Highly Recommended for sure! This entry was posted on Wednesday, March 20th, 2019 at 3:24 pm	and is filed under Film, News. You can follow any responses to this entry through the RSS 2.0 feed. You can skip to the end and leave a response. Pinging is currently not allowed. « ‘Green Book’ – 4K UHD Review!